A longish time ago, my Mom gave me a fountain pen that had been knocking around her family for years. It was a handsome deep salmon colour; I think I used it a couple of times, then set it aside. The next time it occurred to me to use it, nothing seemed to work and I heard a rattling sound inside the pen. So much for that plan! I kept the pen, though, for the sake of continuity with Mom, and one day in Durham I learned that there was a guy who repairs pens, who lived right in town with me (and in fact, who worked at Duke near me). I arranged to meet Ross and to hand over the pen to him for repair. Ross explained this Esterbrook (identification was a no-brainer, since it says ‘Esterbrook’ on the clip and the barrel imprint) was a ‘third-tier’ pen, but that it stood out for having handsome plastics, a simple, easy to maintain lever-filling system, and excellent nibs. 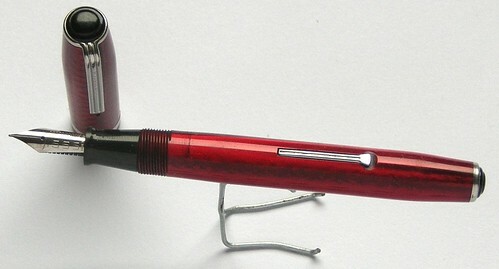 Indeed, Esterbrook nibs are readily interchangeable, and could be obtained in a variety of styles. Esties are hard-working, durable, good-looking, excellent writers, and are still relatively easy to track down in the USA (much less so in Britain; I haven’t seen any bargain Esterbrooks, and only even seen a few that passed through Peter Crook’s hands, via South Africa). These are perfect pens for beginners to collect and repair, and so I (as a beginner) did just that. When I set up the camera to shoot my Esties yesterday, I realised again that the pens will look less attractive than they would after a thorough ultrasonic cleaning. If I were a dealer, I’d track down such a cleaner, but that would be a luxury item for me as a casual user; for the time being, I just polish and buff them by hand. A number of these pens (I noticed) still want repair, which I’ll look into sometime. Without a hair dryer to warm the section slightly, though, it can be hard to open the pen for servicing the sac and J-bar. You can see that although the basic design in the same for each, they vary in small particulars. The fill lever sometimes has a rounded end, sometimes a spade-shaped end. Sometime the clip has ‘Esterbrook’ imprinted on it, sometimes not. The barrel imprint may vary. The coloration of the plastics vary. If I were a serious Esterbrook collector, I’d try to track down as many of these variations as I could, but I’m not that hard-core. So that’s the Esterbrook wing of my pen museum, the oldest specific collection among my pens (I’ve had other fountain pen types from longer ago, but this is the oldest set I deliberately gathered). Gorgeous photos and terrific post! I still have two of my Pens from Grammar school. I attended a new school in Azusa, CA in about 1952 (St. Frances Of Rome) and the nuns only allowed us to use Esterbrook pens. I filled one of them last week and it still writes as well as it did when I got it. My favorite one (a black 2 jewel) must need a new sac as it no longer works. The other is a white purse pen. Both are stamped Esterbrook and are made in the USA. Keep an eye on that purse pen, Michael; they’re less common and more prized. 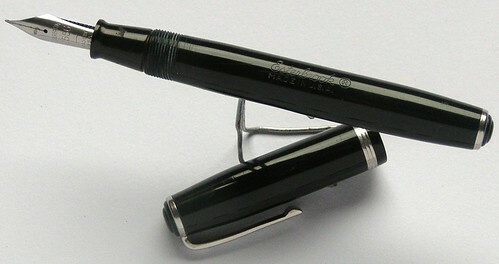 They (especially the white ones) sometimes sold in pairs with a similar pen body that served as a thermometer caddy. The black J should be easy to get repaired (even I can refit Esties). 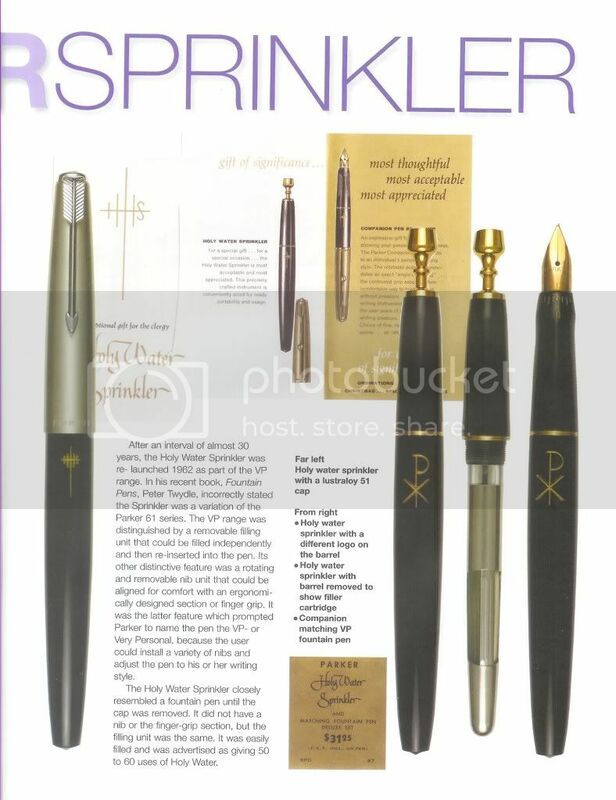 The one I covet is the fountain pen model whose cap unscrews to reveal that it’s an aspergillum. I know Parker made one, and I’ve heard that Waterman did; I don’t know about Esterbrook, but that would be a great catch.